Just as Japanese ramen restaurants, sushi restaurants, and in the extreme fireside grill (robatayaki) restaurants provide their clean freak, and I argue, scopophilic Japanese clientèle with the opportunity to see their food being prepared, so it is with some Japanese coffee vending machines. 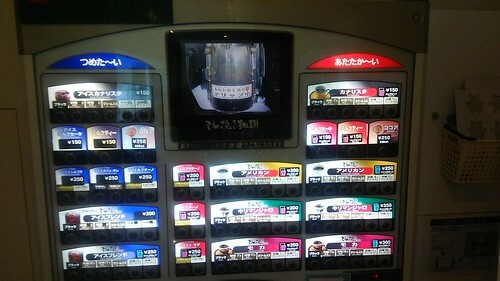 The coffee vending machine shown above, equipped with several internal cameras, provides purchasers with a video of their coffee being made (centre top). I should have taken a video of the inspiring internal video. There is always the possibility that the machine is in fact making coffee using instant coffee powder, and showing everyone the same entertainment video but, even if this were not in Japan, the raw, slightly out of focus, steamy nature of the video made me trust the internal view it provided completely and the coffee taste just a little bit fresher. Visual information augments, and even overwhelms, that obtained by the nose and the mouth. I hypothesise that even if the machine were indeed really using Nescafe and just showing a fake video, I would be fooled into thinking that the beans were ground and the coffee dripped.